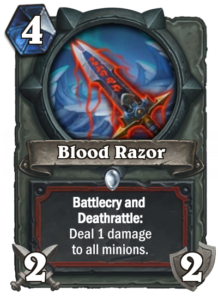 Hearthstone’s The Witchwood expansion reveals continue and today we got to see Darius Crowley, the new Warrior Legendary minion. In this post, I take an in-depth look at Darius and how these new cards may revive Tempo Warrior. 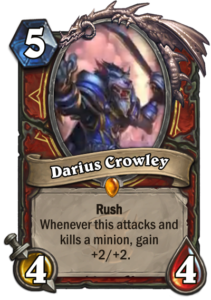 Darius Crowley is a five-mana 4/4 Legendary Warrior minion with Rush and the good old Boogeymonster effect: Whenever this attacks and kills a minion, gain +2/+2. Wait, what? Boogeymonster was one of the worst Legendary cards ever printed, why would there be a reason to get excited about such an effect? Boogeymonster sucked, because it had no immediate effect on the board. Darius can remove a minion and get the first proc of its buff immediately, and the opponent will want to remove it on the following turn to prevent it from growing even further. How does this relate to Tempo Warrior? Well, I am one of the few people who actually played Tempo Warrior during Kobolds and Catacombs, so I have some idea of what the deck was lacking. I tried the deck with and without Pirates, but in the end the Pirate version turned out to be better, as Warrior could not contest the board adequately without them. After the rotation, Tempo Warrior will need a new early-game plan. The Pirate plan was not all that great to begin with, though. Tempo Warrior often relied on Ravaging Ghoul and Blood Razor to start swinging the game back to its favor, and really got to shine in the mid-game. The new cards have some potential to help with this. 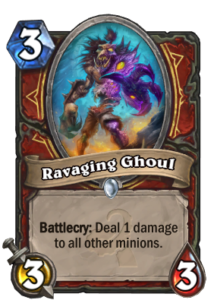 Ravaging Ghoul will rotate out of Standard, but Blood Razor will remain, and various Rush minions can support Tempo Warrior in contesting the board. 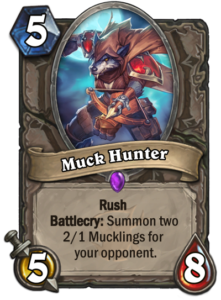 In addition to Darius Crowley, two other Rush minions have been revealed for Warrior: Militia Commander and Redband Wasp, and there is also a Neutral Rush minion, Muck Hunter – which has a great statline but summons a pair of 2/1 minions for the opponent as a downside, a downside that the Whirlwind-heavy Warrior is in a good position to deal with. It is too early to say what the final composition of a Tempo Warrior deck could be. For example, is Redband Wasp worth using, perhaps together with Execute for hard removal, or is Prince Keleseth better? 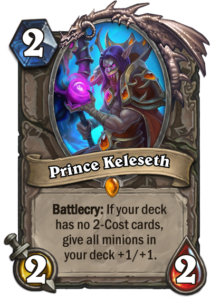 Prince Keleseth has some great synergy with Rush minions, so it cannot be ruled out. Rush minions also help reduce the need for Execute. It is unfortunate that Grimy Gadgeteer is rotating out, as the buffs from that were a major asset to Tempo Warrior. Also, will Tempo Warrior use Spiteful Summoner? It depends on the available weapons (for Lesser Mithril Spellstone) and other available spells. If Warrior gets an expensive spell in the expansion, Spiteful Summoner becomes more attractive. If not, it is down to Mithril Spellstone and Unidentified Shield to carry the Summoner, and they struggle a little with that being only six- and seven-cost spells. 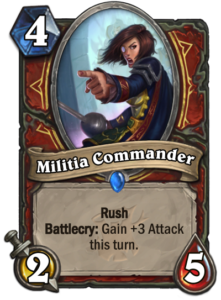 It is early in the reveal season still, but Tempo Warrior is getting some very interesting pieces, and it is an archetype that is good to keep in mind when following new card reveals. Previous Previous post: How will the Standard rotation affect The Witchwood meta?